I figured I start a thread for people to give the reviews of their amps. I'm still burning mine in but I'm very pleased with the sound so for. Working a lot so listening times go a few days between listening sessions. Re: How are you liking the sound from your CF tube amp. i liked the sound of the amp on my new built speakers over the 7channel amp. the tube amp just draws you in and envelopes a surround field that just blew my mind away at carverfest. with sonic holography on dark side of the moon, wow. Today was the first time I've taken the time to plug in my amp since CF. So no burn in and no real run time at all! I'm running a tube preamp that's powered off batteries. Quiet and super smooth. For an amp I've been on a First Watt F1. This makes all comparison kind of unfair as it's a completely different amp in that it's a current source instead of a voltage amp. IE...across the speaker terminals is a steady voltage and it modulates the current. This is exactly what a speaker does anyway so you're leaving out making the speaker convert voltage to current. Speakers are Open Baffle full range crossoverless short line sources that I've put together and are an 8 ohm load. Gain from the CF amp is a little higher that the F1's listed 14db, which is lower than normal. Had to turn the preamp down a few clicks. Noise floor I'm used to being pretty quiet and the CF amp didn't seem to change much. Good so far! The first CD I played was new to me and gave the amp a chance to come up to temp. David Lanz is a pianist that I've seen before and have enjoyed many CD's from for years. This one I found in a used CD shop this week and is a 2004 release called "The Good Life". Nice uptempo Sunday morning smooth jazz music! However it seemed unfocused and didn't have a nice soundstage at all. So I was releaved when I changed to a high rez sampler I've put together of stuff I'm familar with and the sound stage returned and things sounded much better. On DVD-A, this sampler is 26 cuts long and goes through lots of stuff from Beatles, Paul McCartney, Fleetwood Mac, Chicago, Alan Parsons and into some Blues and Bluegrass flavored music and then some nice jazz cuts too. Vocals, both male and female and all kinds of instruments and production styles, but all high resolution and big air, depth and width! The CF amp did pretty well. Not quite as much fluid music presentation, a bit of a shortened sound stage, but no problem with the highs or lows and the frequency response seems smooth. As a real fair check, I decided to pull out another EL84 amp I built a few years ago. It's based on the Dynaco ST-35 design, the baby brother to the ST-70. It uses a 12AX7 input, 12AU7 phase splitter and then the same EL84 push pull output. On my build, I decided to go with a tube rectifier, which is probably the biggest difference from the CF amp. You guys that have just built (or are building) will notice right away that the circuit board construction makes building different than point to point. I did this one with the green Euro blocks so that I can completely unplug and remove the PCB in just a minute if I wanted to. 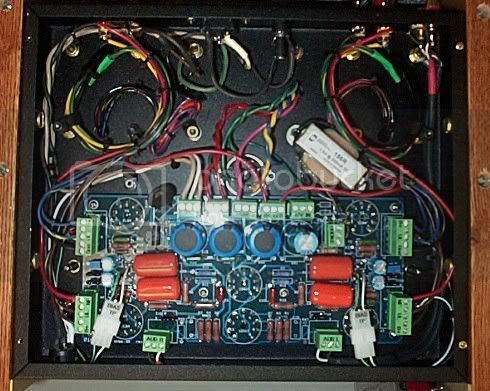 This design is fixed bias, which means once in a while you have to meter and reset a voltage for each output tube. I made this simple with test jacks on the top (3 little pin sockets down each side) and access there too to tweek the pots. Anyway back to the audio amp comparing...I paused the playback and plugged in the Dynaclone, let the tubes come up and went back to play. Immediately a small but noticable difference was there. Just a touch smoother, even before warm up, and a tad more depth. No frequency changes or gain difference. Just a little more music. I'd lay this at the feet of the power supply. There are other small differences but this is something I've spent a lot of time at. I actually have 4 of these Dynaclones in various configurations. Much of which is power supply. And you can hear this smoothness of a tube power supply over SS diodes represented among them. So this probably belongs over in the mods column, but some small but subtle changes on the power supply might be considered. If others also have slightly high B+ like I do, then there is room to consider adding a second stage of filtering. But probably more important and not much cost and no space really, would be change that pair of rectifier diodes. Some HexFred diodes might do a subtle but nice improvement on imaging in this. Something that may be able to be explored at some future time. Last edited by radioeng2 on Sat Oct 01, 2011 9:01 pm, edited 3 times in total. Mark- Have you tried rolling any other tubes yet? I saw a huge difference in the sound stage using reissue Mullards for output vs the Russian Military tubes from the Fest. Chauss wrote: Mark- Have you tried rolling any other tubes yet? I saw a huge difference in the sound stage using reissue Mullards for output vs the Russian Military tubes from the Fest. Nope Chauss. Gotta run enough to at least break in a little before playing much. Not sure what I've got in EL84's around but I'm pretty sure I don't have anything like Mullards! Nice!! What kind of differences did you hear? This kind of info and sources for tubes is what should be interesting for everybody with a CF amp! I've got a buddy with a EL84 that thought the JJ's were nice in it. Though I don't recall now what else he'd tried. The Mullard's give a lot "fuller" sounding bass and airier highs with excellent stereo imaging,- not a lot of depth of sound stage, ,but what can be expected there from a 20W amp? Best guess maybe 5 feet max behind the speakers is it. I am running a pair of Polk RTi8's with them and was quite surprised at the sound I am getting out of them as they were made for HT front channel. They are @ 90db/ 1W/ 1M rated speakers, my Sunfire over-drove them and they sounded pretty crappy in that set up. I also heard a little better detail and transients seemed to have a little more extended decay. 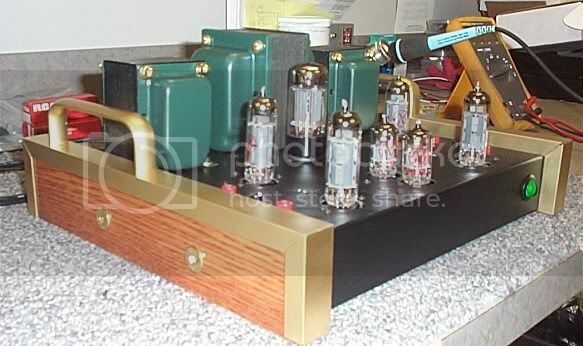 I am new to tube amps never really had any except for a pilot tube receiver. Anyhow I have a total of about 15 hours on my carverfest amps including last nights listening session. I hooked them up to my polk SDA 1C's in my bedroom and was amazed at the open and airy top end these things produced . In my opinion the bass was a slight bit more relaxed but still well defined than when I use my onkyo SS amp . I was really blown away by the increase in the sonic hollography effect over the SS amp, WOW is all I can say. Very easy to listen too, crisp and clean is a good explanation.Oh I forgot to mention I am using the tubes provided by Bob in my two amps . I did by some other 6BQ5's from ebay but have not tried them yet. How many hours does it take to burn in a tube amp anyway? Harry- that is another one of the "controversial" questions of audio...some believe the components need sufficient heat cycles to "break-in" others do not- Some claim the same with tubes, at least certain tubes like the Shuguang Treasures have a lot proclaiming that is FACT. I do not have any direct experience with those tubes to answer that one, but I have not seen it in any of the ones I have used up to this point. As for the CarverFest tube amp- I have not noticed any difference in sound quality other than rolling tubes- but then again.....who knows- maybe that was right at the break-in period! Jesse (F1 Nut) should be able to answer any Polk Q's as to what to look for- he is our resident Polk expert as well as the Polk forum's too! In the mean time- Enjoy the music my friend! Dan, I am using the tube amps in the same area as when I ran the SS state amp. Also I am concidering using just one amp on both 1 C's that way I can use the SDA cable and see what I think of that arrangement. If I am not mistaken our new little tube amps are common ground amplifiers so using the cable with just one amp should not be an issue. The only thing I can think of is that there may not be enough current to drive the 12" woofer in the SDA's...you could rewire the crossovers + add another set of binding posts / jumpers to the crossover and run bi-amped with the SS for the btm end. I have a Rane crossover if you need one. Jesse??? How much power is needed to drive the SDA woofers sufficiently? I'm a bit confused as to the issue. The CF tube amp is stereo, so there will be no problem using SDA speakers with the SDA cable connected. It's a passive radiator...no wires running to it. How much power is needed to drive the SDA woofers sufficiently? A 20 wpc tube amp will drive them, but not like they should be. The more power you feed them, the better they sound. He is running currently dual monoblock CarverFest amps so no common ground unless he goes to a single stereo amp.